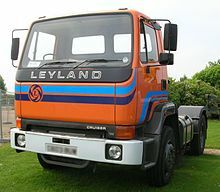 Until the 1980s, the Leyland name and logo were seen as a recognised and respected marque across India, the wider subcontinent and parts of Africa in the form of Ashok Leyland, a company formed from the partnership of the Ashok group and British Leyland. However, now the Leyland logo is no longer used and the company has been largely Indian in its owning for over three decades. Now a part of the giant Hinduja Group, Ashok Leyland manufactures buses, trucks, defence vehicles and engines. The company is a leader in the heavy transportation sector within India and has an aggressive expansionary policy. Ironically, since 1987, when the London-based Hinduja Group bought the Indian-based Ashok Leyland company. 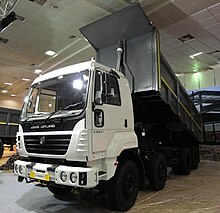 Today, Ashok-Leyland is pursuing a joint venture with Nissan and through its acquisition of the Czech truck maker, Avia, is entering the European truck market directly. With its purchase, in 2010, of a 25 per cent stake in UK-based bus manufacturer Optare, Ashok Leyland has taken a step closer to reconnecting with its British heritage, as Optare is a direct descendant of Leyland's UK bus-making division. ^ Bajaj, J.L. (1994-08-27). "Divesting State Ownership: A Tale of Two Companies". Economic and Political Weekly. Mumbai, India: Sameeksha Trust. 29 (35): M-126. ^ Kent, Gordon (September 1983). Kennett, Pat, ed. "Intertruck: Britain". TRUCK. London, UK: FF Publishing Ltd: 23. MG Motor UK Limited is a British automotive company headquartered in Longbridge, United Kingdom, and a subsidiary of SAIC Motor UK, which in turn is owned by the Shanghai-based SAIC Motor. MG Motor designs and markets cars sold under the MG marque, all MG vehicles are currently assembled in China, and MG Motor is the largest importer of Chinese made cars into the United Kingdom. The marque returned to motorsport in 2012, and won the 2014 British Touring Car Manufacturers Championship. Following the collapse of MG Rover in 2005, the Chinese automaker Nanjing Automobile acquired the Longbridge plant, Nanjing Automobile formally established NAC MG UK Limited as a holding company for the plant and marque on 12 April 2006. In March 2007, Nanjing Automobile unveiled the first MG vehicles manufactured in China, assembly of cars restarted at Longbridge in August 2007, with production of the MG TF LE500. In 2007, Nanjing Automobile was acquired by SAIC Motor, the first all-new model from MG for 16 years, the MG6, was officially launched on 26 June 2011 during a visit to MG Motors Longbridge plant by Chinese premier Wen Jiabao. This car was imported briefly into the UK, but it was not a success and was withdrawn from sale in 2016. By March 2012, SAIC had invested a total of £450 million in MG Motor, sales in the UK totalled 782 vehicles in 2012. The MG3 went on sale in the United Kingdom in September 2013, MG Motor was voted third place for the ‘Best Manufacturer’ category in the Auto Express 2014 Driver Power survey. 2014 saw MG celebrated its 90th birthday, MG enjoyed further celebrations with a record-breaking year that saw the company lead UK car industry growth in 2014. The brand’s sales rose by 361% during 2014 part thanks to the introduction of the MG3 to the product range, on 23 September 2016 MG announced that all car production had ceased at Longbridge and henceforth MG vehicles would be imported into the UK. MG Motor operated the historic Longbridge plant, there is a major research and development facility at the site which employs around 500 people, together with a design studio. Until 2016, final assembly of some MG models took place at Longbridge using complete knock down kits produced in China, MG has a £30 million flagship dealership in the heart of London’s Piccadilly, which was opened in July 2015. Unipart Group is a multinational logistics, supply chain and consultancy company headquartered in Cowley, England. It has operations in Europe, North America and Japan and works across a variety of sectors that include automotive, marine, Unipart as it operates its business today was formed in 1974 by John Egan. 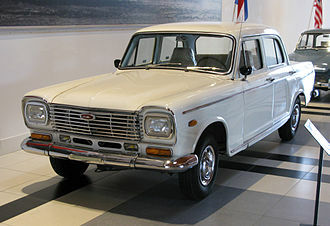 State-controlled British Leyland put him in charge of their Unipart parts and service division, let him make it independent, the use of the Unipart brand to market service parts for British Leyland vehicles was similar in concept to Fords Motorcraft brand. The next year British Leyland was nationalised, Egan left in 1976 to join Massey Ferguson. Then 29-year-old John Neill replaced Egan and he continued Egans policy of providing the same services to its parents competitors as well as to British Leyland. In 1987, shortly after British Leyland had been re-privatised as the Rover Group, Neill led a management buyout of Unipart, Unipart is now 70% owned by its workforce and pension fund, the other 30% is held by sympathetic institutions. Once Unipart were completely independent they returned to Formula One sponsorship, with Tyrrell, for the past 30 years, Unipart has been making products and sourcing product under the Unipart brand. In 1999, Unipart purchased the Partco network which consisted of branches located on industrial estates providing parts into the automotive aftermarket. Over the years, Unipart Group rapidly expanded out of its core business into wider logistics markets such as rail. In 2011 51% of the Unipart Automotive parts business was sold to H2 Equity Partners, the remaining 49% of Unipart Automotive was retained by Unipart Group. A condition of the sale was that Unipart Group exercised no control over the business, H2 previously purchased a controlling stake in another European automotive aftermarket parts distribution company called Sator Holdings, the market leader in Benelux and Northern France. It was hoped that H2s controlling interest in Sator would eventually boost the number of parts offered by Unipart Automoitive in the UK from 90,000 to 160,000, in April 2013, H2 sold Sator Holding to Unipart Automotives main rival Euro Car parts for £176 million. In July 2014 Unipart Automotive entered into administration with the loss of more than 1200 jobs, some branches and 361 staff were sold to Andrew Page and the Parts Alliance. Andrew Page, which has 93 branches and more than £170 million in turnover, is a member of The Parts Alliance, Unipart Group is now working with Andrew Page and the UK Parts Alliance to ensure that British used car owners are still getting Unipart products. Unipart Car Care Centres, which are based in towns across the UK, will continue to be supported, in May 2015 Unipart announced its biggest rise in profits for 10 years, said to be due to continued productivity improvements. Unipart Rail, This division is located in the North of England with sites in Crewe and York and provides engineering, the company has several other brands which it has acquired and trades under such as Dorman who specialise in LED Lighting. In 2016, Unipart purchased Park Signalling, which has 20 staff, Park Signalling continues to trade under its existing name. Mini is a British automotive marque owned by BMW which specialises in small cars. 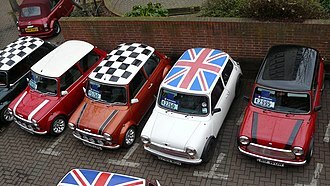 The original Mini was a line of iconic British small cars manufactured by the British Motor Corporation and their models included the Morris Mini-Minor and the Austin Seven, the Countryman, Moke, 1275GT and Clubman. 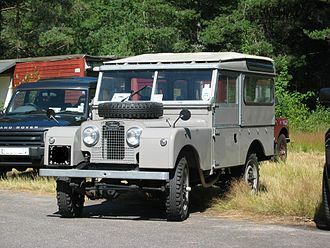 Performance versions of models used the name Cooper, due to a partnership with racing legend John Cooper. 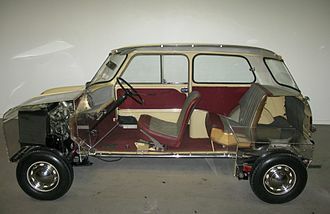 The original two-door Mini continued in production until 2000, Development of a successor began in 1995 and the new generation car was launched in 2001. The current Mini range includes the Hardtop/Hatch/Convertible, Countryman, Coupe/Roadster, the Mini was originally a product of the British Motor Corporation, which in 1966 became part of British Motor Holdings. British Motor Holdings merged with Leyland Motors in 1968 to form British Leyland, Mini became a marque in its own right in 1969. 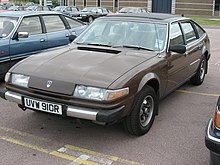 In the 1980s, British Leyland was broken-up and in 1988 Rover Group, in 1994, Rover Group was acquired by BMW. In 2000, Rover Group was broken up by BMW, with BMW retaining the Mini brand, jochen Goller of BMW currently serves as the managing director of the Mini division. The Mini Hatch/Hardtop, Convertible and Roadster are assembled at BMWs Plant Oxford in Cowley, England, a total of 301,526 Mini vehicles were sold worldwide in 2012. Mini vehicles have been active in rallying and the Mini Cooper S won the Monte Carlo Rally on three occasions, in 1964,1965 and 1967, Mini has participated in the World Rally Championship since 2011 through the Prodrive WRC Team. 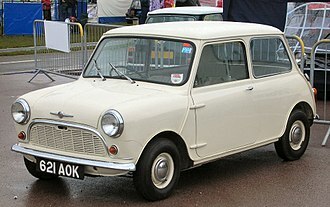 The original two-door Mini was a car produced by the British Motor Corporation. It is considered an icon of the 1960s, and its space-saving front-wheel-drive layout influenced a generation of car-makers, the vehicle is in some ways considered the British equivalent to its German contemporary, the Volkswagen Beetle, which enjoyed similar popularity in North America. In 1999 the Mini was voted the second most influential car of the 20th Century and this distinctive two-door car was designed for BMC by Sir Alec Issigonis. Aveling-Barford was a large engineering company making road rollers, front loaders, dump trucks and articulated dumptrucks or ADTs in Grantham, Lincolnshire. 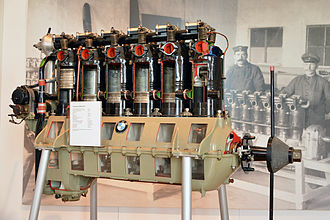 In its time, it was an internationally known company and it had a dramatic formation, and was established by people not new to its field of engineering. 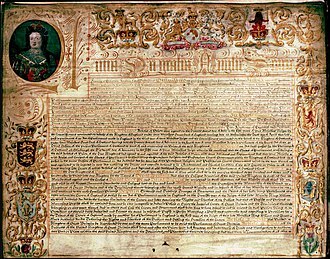 It was formed in February 1934 when Aveling and Porter of Rochester, Kent effectively went bankrupt, at the same time Barford & Perkins of Peterborough were entering administration. 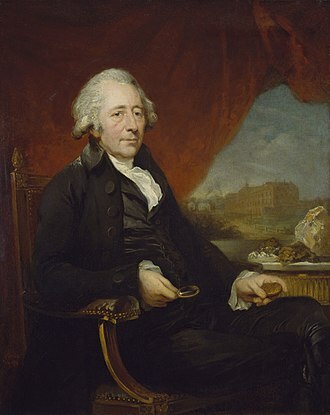 Frank Perkins worked for his company of Barford & Perkins. These two companies were Britains two leading manufacturers of road rollers, the name changed to Aveling-Barford on 13 February 1934. Early in 1934 the business was transferred from Rochester to Grantham on a 36-acre site which was leased from R & H, without the financial assistance of Ruston & Hornsby of Lincoln, both companies would not have survived. R & H funded the amalgamation of the two companies, and gave part of their Grantham site. For many years all the vehicles were powered by R & H diesel engines, R & H had previously made road rollers, but concentrated this all at Grantham. 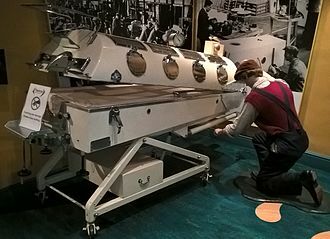 In the 1930s it made cooling equipment for dairy farms, and cooking equipment for hotels, hospitals and it became a public company on 29 June 1937. 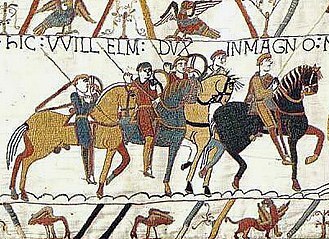 At this time it claimed to make 75% of the rollers in Britain. Edward Barford became the Chairman of the company from 1933, remaining until 1968 and it began making its first earth moving equipment – the Aveling Dumper. During the Second World War the company made Bren Gun Carriers, shell fuse caps, from April 1946 two subsidiary companies were formed – Barford Developments Ltd and Barford Ltd. On 17 September 1946 a new factory in Newcastle upon Tyne was opened, in 1967 it became part of British Leyland. British Leyland engines were to be used as part of the deal, Aveling-Barford were best known for their line of three-point roadrollers including the small GA up to the GC, The Master Pavior 3-point roller was one of the most famous diesel rollers. 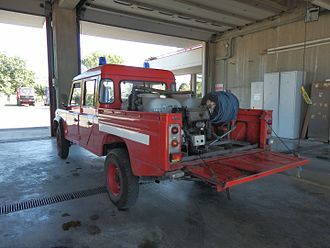 However many other types of earthmoving machinery were designed and manufactured by Aveling Barford in England, A-B were significant for their all wheel driven and all wheel steering motor graders often using Leyland Trucks running gear as were producers of ADT models called the RDX Series with 6X6. Best known for its two-seat open sports cars, MG produced saloons and coupés. Kimber was an employee of William Morris, MG underwent many changes in ownership starting with Morris merging with Austin in The British Motor Corporation Limited in 1952. MG became the MG Division of BMC in 1967 and so a component of the 1968 merger that created British Leyland Motor Corporation. By the start of 2000 MG was part of the MG Rover Group which entered receivership in 2005 and the assets, production restarted in 2007 in China, and at Longbridge plant in the UK under the current manufacturer MG Motor. The first all-new model from MG in the UK for 16 years, the original MG marque was in continuous use, except for the duration of the Second World War, for 56 years following its inception in 1923. The production of predominantly two-seater sports cars was concentrated at a factory in Abingdon, between 1982 and 1991, the MG marque used to badge-engineer sportier versions of Austin Rovers Metro and Montego ranges. A second revival came in the summer of 1995, when the high-volume MG F two-seater roadster was launched, the MG marque, along with the Rover marque, went to the MG Rover group in May 2000, when BMW broke up the Rover Group. The assets of MG Rover were bought by Chinese carmaker Nanjing Automobile in July 2005, subsequently bought by SAIC in December 2007, kimber had joined the company as its sales manager in 1921. He was promoted to manager in 1922, a position he held until 1941. Kimber died in 1945 in a railway accident, the site of the garages was redeveloped in 1980, retaining the original frontage, and is now used as student accommodation by New College. Others dispute this and believe that MG only properly began trading in 1925, the explanation may lie in the distinction between the MG business and the company of that name which may have come to own it later. The first cars which were rebodied Morris models used coachwork from Carbodies of Coventry and were built in premises in Alfred Lane, demand soon caused a move to larger premises in Bainton Road in September 1925, sharing space with the Morris radiator works. The company’s presence has been especially strong in Renton, where it remains the oldest continually operating business. PACCARs assembly plant in Renton was recognized as one of the best workplaces for commuters for the fifth year by the National Center for Transit Research in June 2013. The plant celebrated its 20th anniversary in June 2013 and has produced more than 130,000 heavy-duty and medium-duty Kenworth trucks since it started its operations in 1993. The company built a new factory in Renton in 1909 after its Duwamish facility was destroyed in fire as well as to large number of orders. In 1917 it merged with a Portland firm, Twohy Brothers which was its competitor on the west coast at the time and company was renamed as Pacific Car. The company manufactured horse or oxen-drawn logging trucks built specifically to address the dense, the following years the company specialized in designing air brakes, open cars, refrigerated boxcars for shipment of perishable items and the universal trailer which could be pulled by a truck. The company manufactured structural steel that was finished by hand that was used to create columns, in 1924, the founder, William Pigott sold a controlling interest in the company to American Car and Foundry Company. However, his son, Paul Pigott reacquired a significant interest in the company from American Car, during the late 1930s, Pacific Car and Foundry received government contracts for steel fabrication for construction of Lacey V. Murrow Memorial Bridge as well as orders from other companies. Pacific Car sub-contracted for Boeing, building aluminum wingspans for B-17 bombers, during the spring of 1942 the company built M4A1 Shermans tanks for the U. S. Army. The company was able to cast almost all the parts for the tanks at its own foundry, other notable vehicles that were built included the M25 Tank Transporter, known as the Dragon Wagon, and the T28 Super Heavy Tank. Everett-Pacific Shipbuilding & Dry Dock Company was established in 1942 that built ships and it was bought by Pacific Car and Foundry in 1944. The company was a prime contractor during the Korean War for producing tanks, Pacific Car chose to subcontract many of the necessary parts, boosting smaller businesses in the state. In 1945 Pacific Car purchased the Kenworth Motor Truck Corporation which was named after the stockholders Harry Kent, Kenworth had been producing trucks in Seattle since it was incorporated in 1923. During World War II, Kenworth produced trucks, airplane assemblies and sub-assemblies for the United States military, as the war drew to an end Kenworth shifted attention to production of commercial trucks for the postwar market. In 1956 Kenworth lost independent status and became a division directly under Pacific Car, in 1954, Pacific Car acquired the Dart Truck Company of Kansas City and the Peterbilt Motors Company, of Oakland, California. Dart built primarily heavy off-highway dump trucks and specialty vehicles, Peterbilt had been a major competitor with Kenworth, producing many kinds of trucks and buses. Peterbilt operated as Pacific Car’s wholly owned subsidiary until 1960, following which it was dissolved and made a division of Pacific Car, Pacific Car’s structural steel division made the steel used to build the 50-story Seattle-First National Bank headquarters and to build Seattle’s Space Needle in 1961. SAIC Motor Corporation Limited is a Chinese state-owned automotive design and manufacturing company headquartered in Shanghai, with multinational operations. Its manufacturing mix is not wholly consumer offerings, with as many as 1,000, 000+ SAIC passenger vehicles being commercial vans. SAIC traces its origins to the years of the Chinese automobile industry in the 1940s. Currently, it participates in the oldest surviving sino-foreign car making joint venture, with Volkswagen, SAIC products sell under a variety of brand names, including those of its joint venture partners. Two notable brands owned by SAIC itself are MG, a historic British car marque, a small company in the 1970s, SAIC owes its rise to more than an increase in domestic demand for passenger vehicles. Early success at SAIC may be a result of guidance provided by local Shanghai authorities, for these two reasons and more, SAIC grew swiftly. In the 11 years leading to 1996, annual production capacity increased ten-fold to 300,000 units/year, during this period, SAIC effectively built an entire modern automotive component supply chain in Shanghai from scratch, and the number and quality of locally produced auto parts rose significantly. In 1987, the local parts used in one car, the Volkswagen Santana, were tires and antenna. 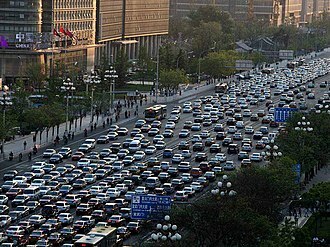 A goal set by the Shanghai Municipal government, creation of a local industry is an example of the influence that the local government has had on the development of SAIC. 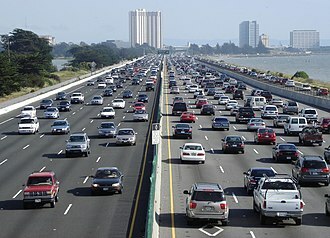 In June 1997, SAIC formed a major joint venture, Shanghai General Motors Co Ltd. The new joint venture operations in 1998, and helped to drive a doubling in SAICs vehicle production between 2000 and 2004. Initially partnering with foreign automakers, creating joint ventures with component suppliers, such as the American Visteon, at the start of the 2000s, SAIC made several acquisitions in Korea. Around this time SAIC created a new holding company for its subsidiaries employed in passenger car production, in the middle of the decade, SAIC attempted to acquire the British automaker MG Rover, but in 2005 was outbid by another Chinese automaker, Nanjing Automobile. SAIC did manage to obtain some MG Rover technology that was incorporated into a new line of luxury sedans sold under the Roewe marque, and it subsequently purchased the winning bidder. Leyland Trucks is the UKs leading medium & heavy duty truck manufacturer and is based in the town of Leyland, Lancashire. It emerged from the bankruptcy of DAF NV as the result of a management buy-out in 1993, since Leyland Trucks was acquired by Paccar it has become the groups established centre for the design and manufacture of light and medium duty trucks. Leyland Trucks operates out of one of Europes most advanced truck manufacturing facilities - the Leyland Assembly Plant, in 2008 Leyland produced more than 24,500 trucks of which 50% were exported. 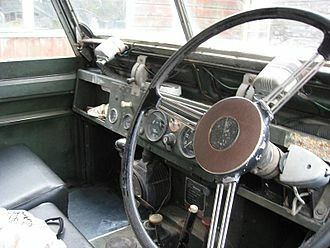 Its history lies in origins as Leyland Motors which subsequently became part of the nationalised British Leyland conglomerate, upon the breakup of BLs successor Rover Group, the truck making division merged with DAFs truck business as DAF NV. When the new company became insolvent a few later, Leyland Trucks emerged as an independent company. 1896 The Lancashire Steam Motor Company is formed by James Sumner at the Herbert Street workshops with 20 employees, the new company begins divesting its non-car manufacturing related businesses. Herbert Austin 1905 "Mr Austin is starting new works, where he will manufacture Austin Cars at Longbridge, near Birmingham"
Tony Benn shaking the hand of Maurice Papon during the official presentation of Concorde, 11 December 1967. Photography by André Cros, Archives of Toulouse. Harold and Mary Wilson (left) greeting the Prime Minister of Australia Harold Holt and his wife in 1967. The Australians strongly urged the British to maintain their military commitment in the Far East.